New. 'Free' MOT at Halfords when you buy a £1 air freshener - and you've 1yr+ to book it. It's a roaring deal as MOTs can cost £55, though it's best for motors less likely to fail. 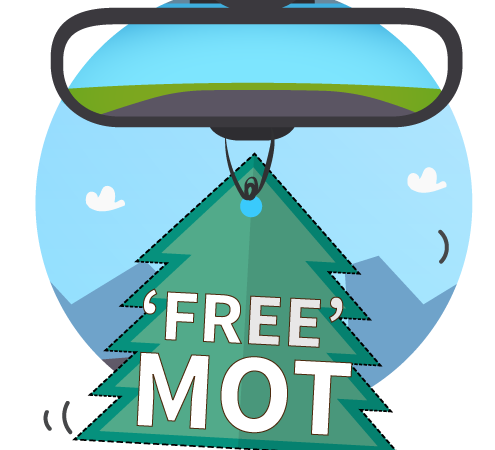 Get full 'free' MOT info, incl how to get a free MOT reminder. How to find the cheapest petrol or diesel near you in seconds. A nifty tool finds your cheapest local forecourt - and the difference between best and worst can be huge. Eg, in Manchester it's 121.9p/L to 135.9p/L. See petrol comparison. Whatever you pay for fuel, check out 7 ways to cut fuel use by 30%. Drive clever to drive cheap - see cheap driving tricks. NEVER auto-renew car insurance - and check for cover 3wks before renewal. Car insurance is like comedy - timing matters. We've found the best time to buy is three weeks ahead, and if you've less time, then hurry, as prices tend to rise the closer you get. - Check if hot deals & insurers that comparisons miss win, eg, £60 Amazon vch via Age UK. See deals comparisons miss. - Also check if counter-logical savings work. Eg, if comprehensive's cheaper than 3rd party, whether adding extra drivers slashes costs or if legitimately tweaking your job description cuts costs. Check your photo licence or risk a £1,000 fine. More than 2 million have expired - see how to check (and what to do if it's invalid). Get 5% cashback when you buy petrol or diesel. The Amex Platinum Everyday card gives a massive 5% introductory cashback for 3mths (max £100), then up to 1%. Driving in Europe? Check if you need an emissions sticker to avoid a fine. Plus more help incl equipment needed, insurance requirements and speed limits in our new Driving in Europe guide. Smoke with kids in the car & you can be fined £50. Since 2015, anyone in Eng & Wales (driver or passenger) who smokes in a private vehicle with someone aged 17 or under could face a fine. Full breakdown cover for £48 for 15mths, basic from £20. For full cover (incl home start and onward travel), AutoAid* charges £48.31 for 15mths. It covers any car you, your spouse or civil partner drive. For comparison, an equiv AA policy is £100+. If you don't need full cover, see how to get basic RAC/AA cover from £20. 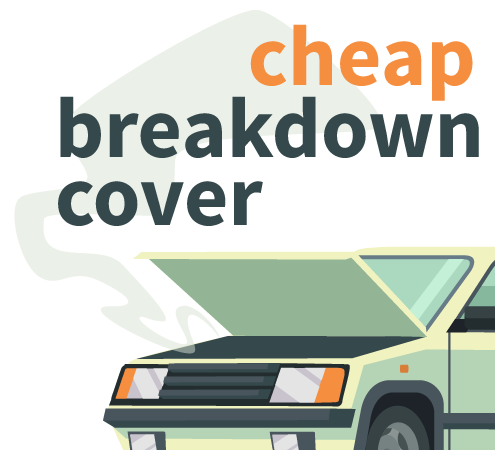 More help and tips in Cheap Breakdown Cover. Got an unfair parking ticket? The good news is 50%+ beat unfair council tickets even after rejection. Even if you lose an appeal, go all the way to the final tribunal and more than 50% win. See how to fight unfair COUNCIL parking tickets. Don't believe private parking firm 'fines' - they're just invoices. Many tickets from supermarkets, retail parks and private car park firms do better impressions than Alistair McGowan. Some even call them Parking Charge Notices to mimic official Penalty Charge Notices. If you get an unfair private ticket, you can fight it - see our Fight Unfair PRIVATE Parking Tickets guide. Car (or bike) damaged by a pothole? You could be due £100s. Use our Pothole Claims guide to see if you're due. Ride your way to motorbike insurance savings. It's not just car insurance - you can also slash bills if you're on a motorbike or scooter. See our motorbike insurance cost-cutting system. Smash parking costs by renting a driveway. See if you can rent a private space for less. We found £8/day in London compared with NCP's £19. N ew. £200 to switch - £150 upfront, £50 if you stay for a year. HSBC has revived its mega-popular Advance Account* offer for switchers. 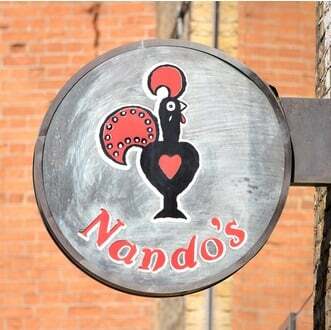 As well as the £200, you can access its 5% regular saver. How do I get it all? 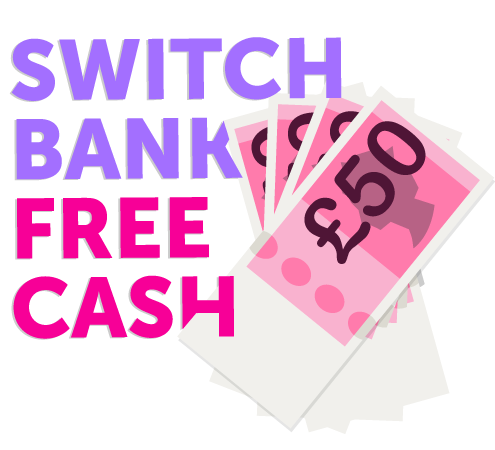 For the £150, open the account and do a full switch (incl 2+ direct debits or standing orders) within 30 days. If you've got the account after 1yr and have registered for online or mobile banking, you get another £50. You need to pay in a min £1,750/mth (equiv £25,900/yr salary), and can't have had an HSBC account since Jan 2015. New. Top service + freebie incl £199 Bose headphones or £150 Expedia vch. With First Direct* it's all about service - it's topped every bank customer service poll we've done, with 89% rating it 'great' in Aug. It already allowed new switchers to pick a freebie from a range of tech products, online courses (eg, yoga, cookery) and the Expedia vch. And this week via our link it's added higher-end tech products, incl the headphones above, £165 speakers and £159 headphones/charge case combo. You also can access a 5% regular saver and many get a £250 0% overdraft. How do I get it all? Pay in £1,000 within 3mths of account opening, then £1,000+/mth (a salary of £12,675+ does it), or there's a £10/mth fee. For the freebie, you're emailed a link within 2 weeks of switching and paying in, with instructions on how to claim. Free £185 M&S vchs - £125 upfront and £5/mth for a year. New switchers to M&S Bank* get all that and access to its 5% regular saver, while many get a £100 0% overdraft. How do I get it? 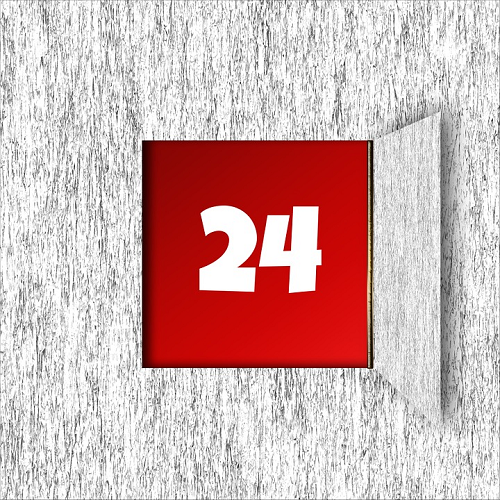 To get the £125 you must fully switch, incl 2+ active direct debits, within 3mths of opening. 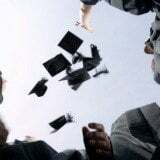 For the £5/mth, pay in £1,000+/mth (equiv £12,675/yr salary) and keep the direct debits active. Full info and more options in Best Bank Accounts, incl lots more on how easy it is to switch. Stop press. New uber-cheap Big 6 energy tariff - save £300/yr. An E.on 1yr fix that launched today is sub-£950/yr after MSE cashback on typical dual-fuel use in 10 of the 14 Eng, Wales & Scot energy regions, which incl many big cities (it's also for elec-only). With prices rising elsewhere, it's mega-cheap, and at its £920/yr lowest, is £300ish less than the avg Big 6 standard tariff on typical use. Check if it's your top biggie via our Cheap Energy Club big-name comparison. For overall cheapest, do a full market comparison. British Gas cust & won't switch? We've a no-brainer £200/yr saving below. Ryanair U-turn as 2 million can now escape new baggage charge - but millions more will still be hit. See full help to check your Ryanair hand luggage allowance. New. NHS free prescription checker. Do you qualify for free meds? See free prescription checker. Wetherspoon pubs - 7.5% off for one day. On everything in Eng, Wales and NI - but not alcohol in Scotland. See when you can get a rare Wetherspoon discount. Please be Drinkaware. 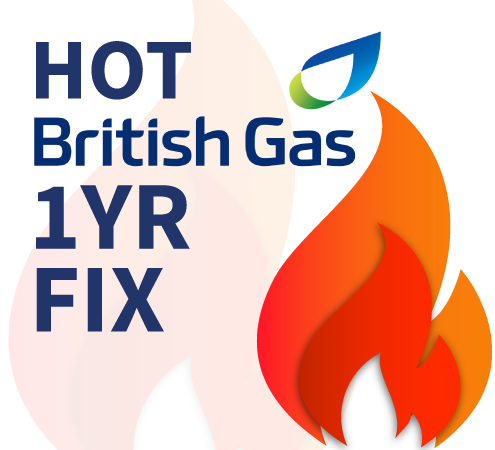 How British Gas customers can save £200/yr. This is all about the new British Gas Energy plus boiler cover Oct 19 tariff. On typical usage it's roughly £200/yr cheaper than British Gas's standard deal. Plus the rate is fixed for a year, so you're protected from price hikes, though the amount you pay can change as that depends on usage. And most homeowners get £50ish boiler cover thrown in for 'free'. - Who can get it? It's open to new & existing dual-fuel (ie, gas & elec) customers paying by direct debit. - How to get it. The best way is via our Cheap Energy Club comparison to get the extra £25 cashback you don't get going direct. 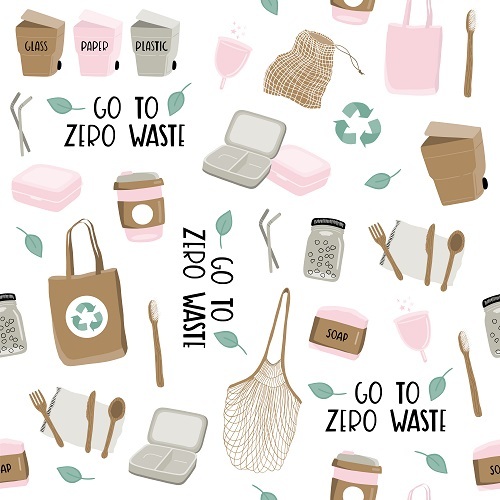 It only takes a few mins and you get to see exactly how much you save that way. - Owt else I need to know? If you don't already have a British Gas smart meter, you'll need to agree to get a free one as part of signing up. Do that and it means you won't need to give meter readings in future. If you have a smart meter already and you switch from elsewhere it may lose some of its 'smart' features, but you can still get the deal. If I'm willing to move firm, how much more could I save? The market's cheapest deals are from smaller firms and can save you a further £150/yr (with typical use) - and many of them have good service feedback. Click the comparison link above and for ease we've defaulted it to 'big-name only' tariffs so you can see the British Gas deal, yet use the filters and you can see all the market's deals or just those with good service ratings. Ends Sat. No contract, 8GB, unltd mins & texts Sim: £15/mth + £20 Amazon vch. This pay-as-you-go deal from Smarty* (uses Three's network) is cheap and refunds £1.25/mth per unused 1GB, so use 2GB and you effectively pay £7.50/mth. You're also emailed a £20 Amzn vch within 3mths, provided you activate the Sim and make three monthly payments. Full help in PAYG Sims. While this Sim gives flexibility, standard contract Sims can be cheaper. This is a bit of a hybrid credit card: good if you're a Sainsbury's shopper keen for extra points, or if you're looking to borrow the cheapest way... or both. But as we always say, NEVER use such cards as an excuse to overspend or fill income gaps. How do I get the free £37.50 to spend at Sainsbury's? 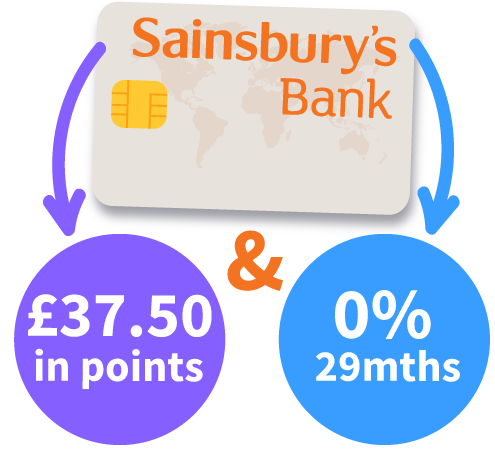 Accepted new Sainsbury's Bank (eligibility calc / apply*) cardholders get 750 bonus Nectar pts (worth £3.75 to spend at Sainsbury's, as each point is worth 0.5p there) for every £35+ spent at the supermarket in the first 2mths, up to 7,500 pts, which is worth £37.50. That's on top of the normal 2 pts per £1 spent at Sainsbury's. To max it, just do your normal shopping there (it's not an excuse to overspend). You can even split your shop to hit the trigger quicker. On, say, £120, put it through as £35, £35 and £50 - each gets 750 bonus pts. But you may get a few looks if there's a queue. For full info and more deals, see Credit Card Rewards. I need a 0% card - is this any good? Yes. Its 0% period has just risen from 28 to 29mths, making it the longest 0% spending card. And if accepted you get the full 29mths at 0% and of course you get the points if spending in Sainsbury's. Though only borrow if you NEED to, for a planned, affordable purchase (eg, replacing a faulty fridge). Get it wrong and you'll get burnt. Full info and more options in 0% Spending. Will applying hit my credit score? A full application leaves a mark on your credit file which is trivial unless you do lots in a short time or are about to make an important credit application, eg, a mortgage. Use our free eligibility calc to see your chances of getting this and other top cards, without affecting your score. Always follow the 0% Spending Golden Rules (see APR Examples). a) Always pay at least the monthly min and stick within your credit limit or you can lose the 0% and get hit with fees. b) Plan to clear the card (or balance-transfer) before the 0% ends or the interest rate will jump - on the card above, it'll go to 19.9% rep APR. "Just wanted to thank you for the guidance I found on your site regarding broadband haggles. I made a £198 saving over 18mths for a 22-minute call." Got a question about your pension, or just want to know how to start saving? If you can get to Leicester, Cardiff, Reading or London this week, you can jump aboard a double-decker bus packed with pension experts for free guidance and info. Check out the Pension Awareness Day website for its timetable - if you can't catch it, our Personal pension need-to-knows guide has plenty of info too. Have you haggled with Sky, BT, the AA and more this year? Did you succeed? Haggling with service providers can net big savings - on anything from digital TV to insurance. So please let us know if you've gained cheaper prices, extra goods or better deals. Have you successfully haggled this year? Many parents aren't allowed to buy cheap school uniforms. State primary schools have the most relaxed requirements, with a third allowing parents to buy uniform from supermarkets - compared with just 6% of private primary schools. In contrast, seven in 10 secondary schools (state or private) insist parents have to buy everything from a specific supplier. See full school uniform poll results. - Top story: 'We saved £960 on our train journey': is this the biggest split-ticketing success ever? - Zen tops our broadband customer service poll - where does your provider rank? - Old-Style board thread of the week: How do I make my own spray oil for cooking? - Family, marriage, relationships chat: Where is the weirdest place you've been asked out? - Discussion of the week: What is your attitude to discussing your finances generally? Q: I'm moving home in a few weeks - how do I make sure I'm not charged for energy used after I move out? Peter, via email. MSE Andrew's A: Make sure you contact your energy firm and let it know you're moving - and give it at least 48 hours' notice. On the day you move out, check your meter and inform your existing supplier of the readings so it's aware of what you've used at that point. Also give it your new address so it can send you a final bill. Then take opening meter readings for your new home so you're only charged for what you use there. Plus, do a comparison via our Cheap Energy Club to get on the best deal in your new place - you'll usually be put on a 'deemed contract' with the existing supplier to the property, often an expensive standard tariff. MY LANDLORD WANTED £100 TO REPLACE A LIGHTBULB... AND £50 TO CLEAN IT. WATT THE...? That's all for this week, but before we go... how many landlords does it take to change a lightbulb? Serious question. Our very own MSE Callum was quoted the ridiculous prices above but being a savvy MoneySaver, he at least got them down to £35, and saved on other hefty charges. Do you have stories of similar rip-offs and did you successfully challenge them? Read Callum's lightbulb rip-off story and share your tales in the comments section of his blog.